Even though it's a winter outfit, it actually reminds me of spring! That color is almost like a rustic daffodil and currently in Kansas, they are so close to getting ready to bloom that I have hope it's not going to always be so bleak! Isn't it funny how clothes can give us hope?! 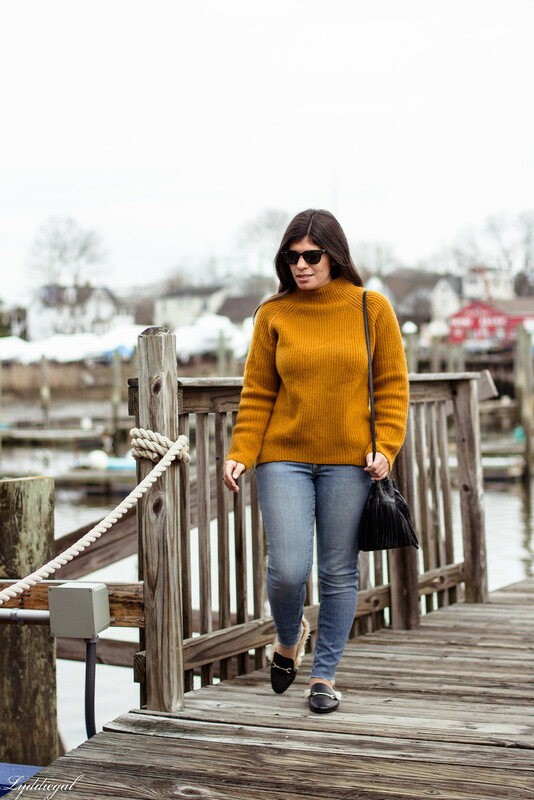 I love the marigold color of this sweater! And it looks super cozy for transitional temps! 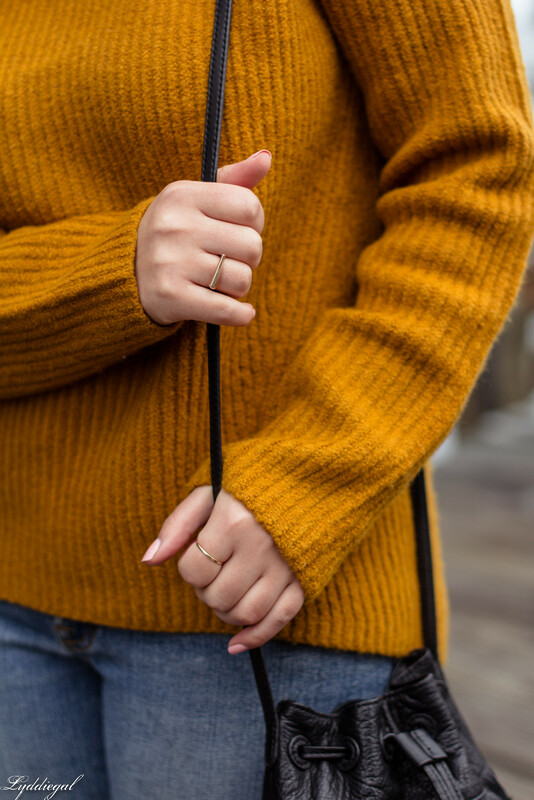 Perfect mustard sweater for a very nice outfit! I always get bummed when everyone else is really celebrating spring, and springtime to us means snow--ha ha! But it's all good, and those shoes are the perfect way to keep warm and still not be covered all the way!!! Similar weather here in NY, it has been a gray rainy winter, kind of reminds of Seattle though still no where near rainy as that but rainy. A two polar vortex but other then that not super cold just gray. And this color is perfect for combatting the gray weather, you look great! That's a very good point you make about taking photos when no one else is watching because no one wants to be outside in the cold except for blogger who need to get the shot, lol. Nice pics... love the color of your sweater.. I love the color of your cozy sweater! It's too cold here to give up my sweaters yet. Spring weather is too fickle! I am so looking forward to more day light!! I am so ready for Spring and if only the weather changes too haha. I love your mustard colored sweater! I sort of love the look of an isolated dock in colder weather months - it makes such a nice background. And I just love the shoes you're sporting too, they look so cozy. I love spring--even when it's early and you just get a few teaser days and then cold again... I love it. But yay for cozy bright sweaters like that one that make the cold days that inevitably come feel a little better. I need more bright sweaters I think! 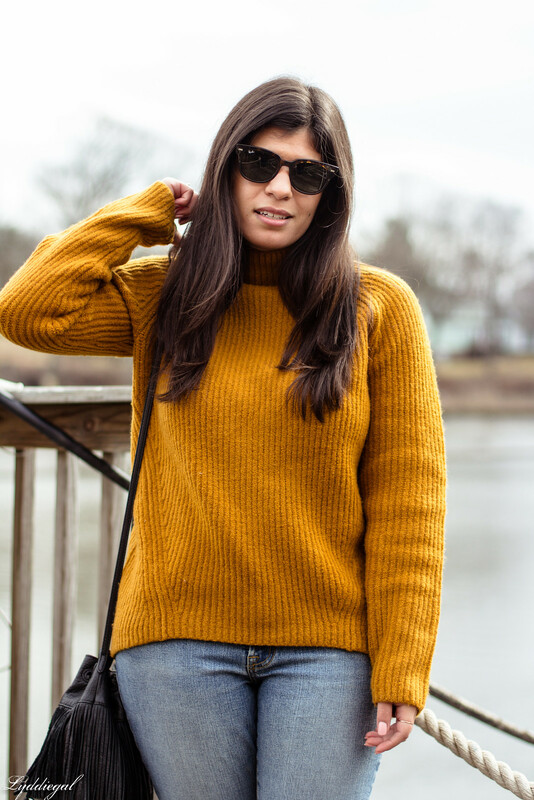 Love this shade of yellow, gorgeous sweater. Love those fur slipper mules- I have a similar pair and I LIVE in them. Cannot again re: spring. SO. Ready. I am so with you, I keep pretending that spring weather is right on the horizon... it is not. All I want is to wear spring fashions!! I do however love this look, your sweater is so pretty and I really need those mules! Girl I can't wait for spring weather either! 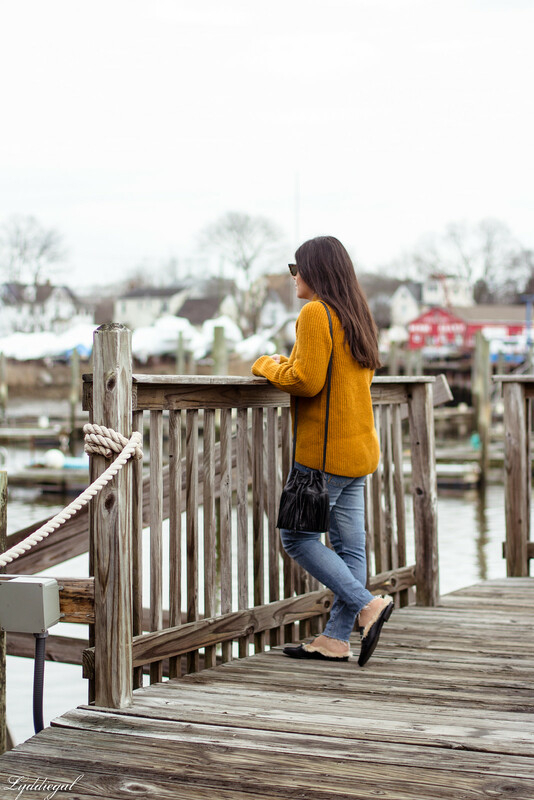 Love your mustard sweater and those furry slides. Hopefully only a few more weeks of sweaters though! But good thing the furry slides can last a bit longer. I love this sweater, it's such a gorgeous color! I can't wait for Spring weather to stick around. Beautiful colors in this outfit and they work magically with the back drop. Oh and I'd prefer an empty space just for me and taking my pics. That mustard sweater is to die for and girl I feel you on the weather. 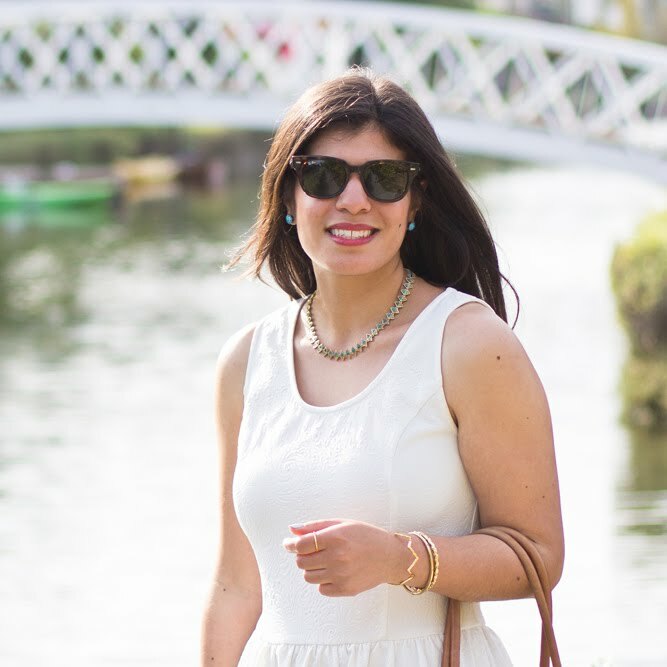 Welcome by and join our new Sunday linkup! This color looks so good on you and I love those shoes! I think we are all waiting for spring. Even here, it makes appearances, but I'm ready for it to come and stay. That's such a cute bag, and I love your mustard knit! :) It's funny the weather is so different here, I'm just waiting for it to cool off so I can wear some knits and layers for a change, haha! Hope you are having a great start to your week! I've lost my voice so not the best week for me, haha! Oh those mules are too cute! I'm sending you sunny vibes from my corner of the world! Cute and coy sweater, but those shoes look so comfy. I would love to have those too. This is a winter outfit, it's true. But it doesn't involve a coat and that alone makes it feel spring-like to me. 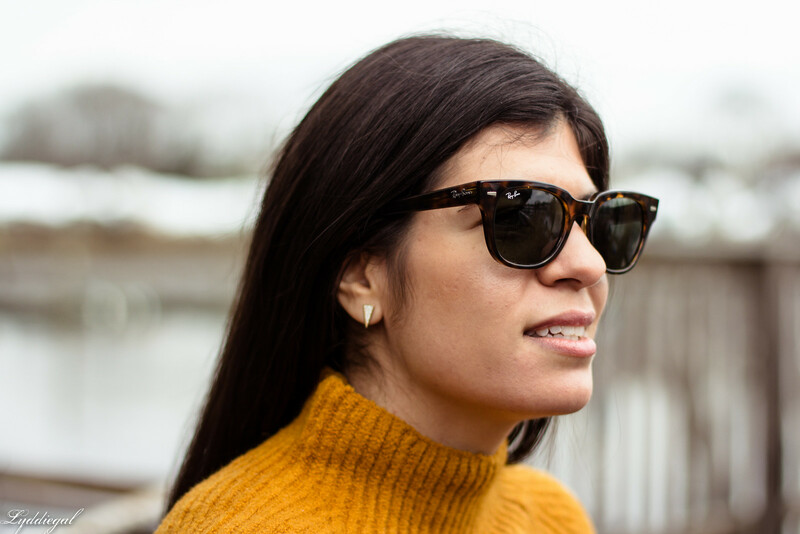 To be honest, I fell in love with it as soon as I spied it on instagram and my enthusiasm for everything about it, head to toe, hasn't waned since. I haven't worn mustard since 2012. I haven't even considered wearing mustard since 2012. I shake my head when I see mustard pieces in stores. But you in those look could be all the convincing I need that mustard is, in fact, a beautiful and wearable colour - and that is no small thing! Very nice look! The sweater is great!